The fire is roaring!!! Chad is reading while I'm tending to the stock. Remember back in November when I posted this first part to my trip up to Portage, Wisconsin? Well, here is the long-awaited sequel to this weekend of cooking and r-and-r (I know, finally!) I left off with how to cook a chicken - did you try it? How easy was that! It just takes a little time for the cooking part. So now you have this huge bird. Now what? I gutted the bird - it gives you SUCH great meat! Well, for some crazy reason I was wanting to make some chicken stock. I go through these phases where I get so mad at the grocery store - there is so much crappy food out there. Or food that they fill with all this stuff you've never heard of. It's very difficult and expensive to get the better food - that just ticks me off. I believe quality food should be readily accessible and affordable for everyone. Here is what the stock looks like - all the veggies are chopped and I'm simmering away. Once the stock was actually complete, I really was a bit disappointed. I was envisioning it being the best I'd ever tasted! Turned out it didn't have much flavor - probably because of the normal salt and MSG that we have grown so accustom to in food. 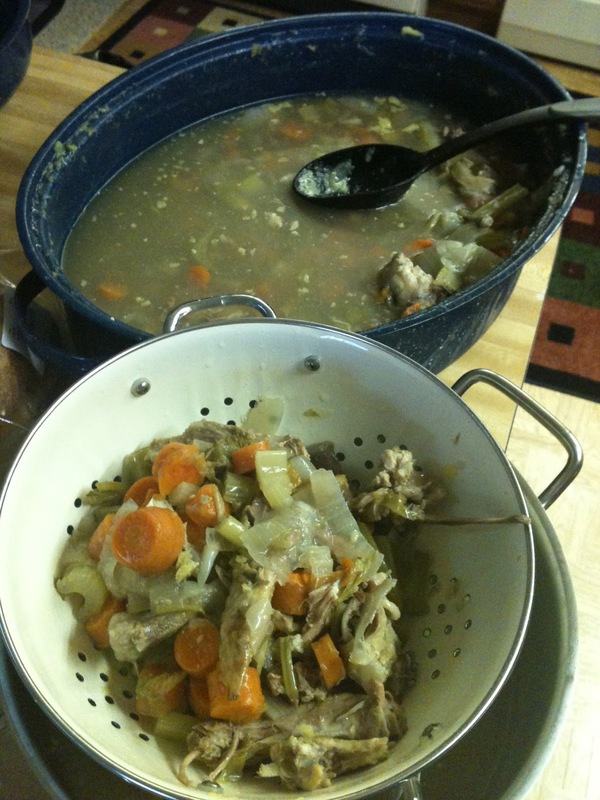 Anywhoo - I believe the next time I make chicken soup, I will save the time it takes and spend a bit more on low-sodium, organic chicken stock. I'm sure it's probably just as good as what I spent all day making. Plus, I was not too thrilled at all the carrots, celery, and onions that got thrown away after. It seemed like more of a waste. This is what it looks like when you remove all the junk from the stock. It was a messy process. But, I have to say, the chicken soup was AMAZING! Making it from scratch with the chicken, and I added whole-wheat egg noodles. My favorite thing to have with a great soup is an equally great bread. We got one of those fresh-baked loaves from the bakery section of the grocery store. Slap on some butter and it's a feast! 1. After you've removed all the edible parts of your chicken, put everything else in a very large stock pot. 3. Add Veggies (you can add others if you would like). Include carrot tops and celery tops - anything that will give the broth flavor will work. 4. Add your herbs and spices and set the pot to boil. Boil with the lid on ffor the first hour. Then remove the lid and allow the stock to cook down until it achieves the strength of flavor you enjoy. Taste about every 45-60 minutes. 5. Allow the pot to cool and place in fridge overnight. 6. Skim off any fat that has risen to the top. 7. Drain the entire contents of the pot through a sieve into another large pot. 8. Throw out the remains and bottle your stock. Storage: If you won't be using your stock within 3 days of making it, it can be frozen for 6 months to a year. But, I recommend you us frozen stock no later than 8 months for flavor. Heat olive oil in a large soup pot over medium heat. Add onion, carrots, and celery and saute for about 5-8 minutes. Do not brown. Add 8 cups low-sodium chicken broth and simmer for 15 minutes. Add the rest of the chicken broth to the large soup pot along with the whole black peppercorns and bay leaf. Add chicken to the soup pot. Turn heat up and return to boil. Add water and noodles. Boil 15-20 minutes until noodles are done. Add freshly ground pepper to taste and 1/4 cup parlsey. Stir to combine, remove bay leaf, and serve.